Lee Tomlin in action for Posh. 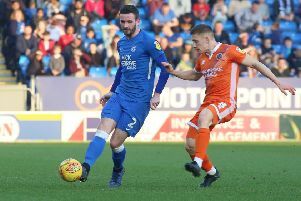 A rejuventated Lee Tomlin is ready to fire Peterborough United into the League One play-offs. 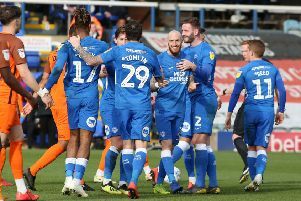 Tomlin is expected to return to the Posh starting line-up for the League One game against struggling Southend United at the ABAX Stadium after undergoing an intensive fitness programme under new boss Darren Ferguson. Indeed Tomlin credits Ferguson for re-kindling his enthusiasm for football. “There have been lots of things going on around me and I did wonder if I wanted football any more.” Tomlin stated. “But the gaffer coming back reminded me why I play this game. “I’ve not really enjoyed football for a few years. I’ve been going to work without smiling and I couldn’t wait to get back home again. “But I’m in a really good place again now. The gaffer’s had me working non-stop on my fitness and I’ve shed 6-7kg since he came back. “I’m ready to kick on again now and I’m ready to do what I wanted to do when I came here which is win promotion. Anything else would mean I’ve wasted the last few months. “People will have opinions on our chances, but no-one in our squad has given up. We all believe we can do it and would be a great achievement if we did. “We will keep fighting until it’s impossible. If we win the last eight games we will definitely finish in the top six and anything is possible then. “Pressure has never really affected me. I love playing football and I’ve always been confident about my ability. Tomlin (30) has scored just once in 13 appearances since joining Posh on loan from Premier League Cardiff City in January. He was a star player in the club’s last promotion from League One in the 2010-11 season.